President Ronald Reagan gave the 1987 State of the Union Address. The 1987 State of the Union address was given by President Ronald Reagan to a joint session of the 100th United States Congress on January 27, 1987. The speech was the third State of the Union address of President Reagan's second term. 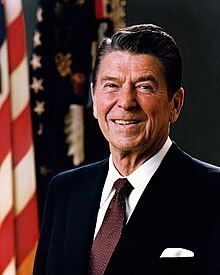 Reagan said, "The Soviet Union says it wants a peaceful settlement in Afghanistan, yet it continues a brutal war and props up a regime whose days are clearly numbered. We are ready to support a political solution that guarantees the rapid withdrawal of all Soviet troops and genuine self-determination for the Afghan people." He ended with, "But now at length I have the happiness to know that it is a rising and not a setting Sun." Well, you can bet it's rising because, my fellow citizens, America isn't finished. Her best days have just begun." The speech lasted 34 minutes and 39 seconds and had 3847 words. The address was broadcast live on radio and television. ↑ "State of the Union Address: Ronald Reagan (January 27, 1987)". InfoPlease. ↑ "Length of State of the Union Addresses in Minutes". Presidency.ucsb.edu. Retrieved 2012-05-29. ↑ "Length of State of the Union Addresses". Presidency.ucsb.edu. Retrieved 2012-05-29. ↑ "List of Opposition Responses to State of the Union Addresses". Presidency.ucsb.edu. Retrieved 2012-05-29.